Thisstory was updated at 7:51 p.m. EDT. 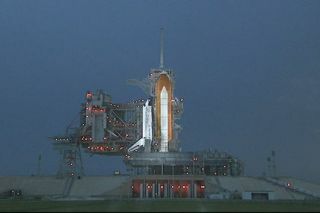 NASA hasdecided to skip its next chance to launch the space shuttle Discovery and isnow targeting a late Friday liftoff. After a 10-minutemeeting today, shuttle mission managers opted to forgo the first of twolaunch opportunities on Friday and aim directly for an 11:59 p.m. EDT (0359Aug. 29 GMT) liftoff instead, NASA spokesperson Allard Beutel told SPACE.com.It will be NASA?s third try this week to launch Discovery on a constructionflight to the International Space Station. Targeting alate Friday launch, rather than an earlier 12:22 a.m. EDT (0422 GMT) liftoff,allows engineers more time to draw up plans on what to do if a critical liquidhydrogen drain valve in Discovery?s main propulsion system fails another testduring fueling, Beutel said. If the plan checks out, NASA would begin fueling Discoveryonce again tomorrow at 2:34 p.m. EDT (1834 GMT) for the launch attempt. ?To makesure we a truly bulletproof story ? we decided to give them one more day,? saidMike Moses, head of Discovery?s mission management team, in a Thursdaybriefing. Duringfueling operations Tuesday for a Wednesday launch attempt, the so-calledfill-and-drain valve failed to indicate that it was properly closed during astandard check. NASA?s launch rules require the valve to function perfectly forliftoff so mission managers calledoff the attempt. The valveis part of the plumbing system in Discovery?s aft that allows NASA to pump the526,000 gallons of super-cold liquid hydrogen and liquid oxygen propellantthrough the orbiter and into its 15-story external tank. The system is alsoused to drain the huge tank if launch is delayed. NASA?slaunch rules currently don?t allow engineers to repeatedly cycle the valveduring fueling when it is subjected to the cryogenic temperatures from theliquid hydrogen propellant. The worry is that doing so could cause a valve onthe cusp of failure to break or jam. Moses saidengineers believe that the position sensor which detects whether the valve isopen or closed is most likely at fault. They are nearly complete with newtesting protocols to cycle the valve during fueling as a final check if theglitch occurs again. They willbring those plans to Moses?s mission management team during a Friday meeting at12 p.m. EDT (1600 GMT) in order to decide whether waive the no-testing duringfueling rule and proceed with launch. It wasMoses?s team that met today and opted to stall the shuttle launch to give engineersmore time. The move allows the engineers to draw up the valve testing plan andthen rest since they would also be involved in performing those tests if thevalve glitch reappeared late Friday. ?The betterpart of valor here is to take a day, let us go polish that off and really makesure we really understand what's going on,? Moses said. Duringambient temperature tests late Wednesday, the hydrogen drain valve performedexactly as expected, opening and closing five times under remote control byNASA engineers. Discovery?sshuttle mission has been delayed since Tuesday, when stormy weather thwartedits first attempt that morning. NASA had begun fueling Discovery later thatday for the Wednesday launch try when the valve glitch occurred. NASA hasuntil Sunday, Aug. 30, to launch Discovery before it would stand down due to aschedule conflict with another operation on the Air Force?s Eastern Range,which is used for rocket and shuttle launches. Commandedby veteran spaceflyer Rick Sturckow, Discovery?s seven-astronautcrew plans to fly a 13-day mission to the International Space Station todeliver a new crewmember and nearly 8 tons of science gear and other supplies.The shuttle is also carrying a new space treadmill named after televisioncomedian Stephen Colbert. IfDiscovery cannot launch by the end of August, NASA would likely stand down untilOct. 17 due to space traffic conflicts at the International Space Station. An unmannedJapanese cargo ship is slated to launch on its maiden flight to the spacestation on Sept. 10. Another cargo ship, this one Russian, is also due todepart the orbiting lab next month and be closely followed by the Sept. 30launch of a Russian Soyuz spacecraft carrying a new crew and Canadian spacetourist to the outpost.